This guest blog post is authored by Luke Davies, LeanIn President and Brightcove Technology Partner. LeanIn is the world's first in-video search company. They make it really easy for viewers and for search engines to find the exact scene they are looking for. 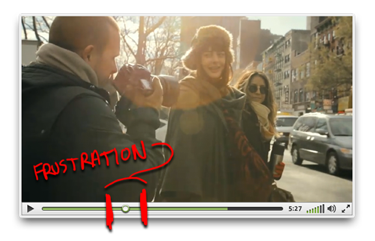 They also make it really easy for your viewers to share a specific scene of a video with their friends. Learn more about LeanIn. Either I’m really impatient, or searching for a scene that I want to watch in an online video is really, really hard. Not hard like ‘calculus after a night of drinking’, or ‘picking up a steamer that your dog dropped’ hard. More like ‘trying to cut your lawn with a pair of scissors’ hard. My frustration stems from the fact that the scrubber is just not an efficient tool for searching! I’m always either a little too far forward, then a little too far back, then a little too far forward… you catch my drift. This dizzying back and forth gives me digital sea sickness. Its what we refer to at LeanIn as The Frustration Range. The Frustration Range is that area where you are scrubbing back and forth and back... trying to find that special scene. Imagine how many more cats stuck to ceiling fans, or toddlers sacking their dads, you could watch if it weren’t for that pesky frustration range? In an attempt to make the world a better place, LeanIn has developed powerful scene-based search tools that allow you to quickly navigate to whatever it is you’re looking for. 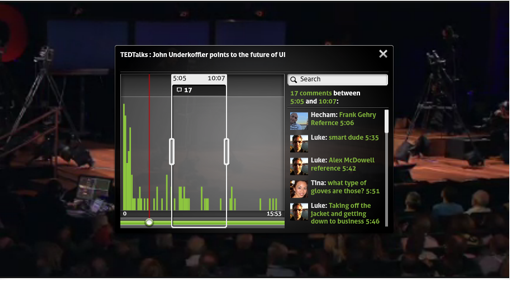 With LeanIn viewers are rewarded for identifying interesting parts of video and tagging it. Also, as viewers share video - and describe what they are sharing - with the LeanIn service, all of the relevant meta data gets stored at the exact frame where it belongs. No more scrubbing, no more wasted time. Learn more at www.leanin.com, or follow us @leanedin.